Reality has been conceived as an Absolute beyond all manifestation, beyond all creation, beyond all cognitive experience. It is an X that can be experientially perceived either by transcending or by denying all existence, by surpassing all cognitive experience. When we transcend all manifestation we name the Absolute as a Being or Absolute Brahman. When we negate all manifestation or consider it to be ephemeral and meningless, we use the term Non-Being or Void or Zero. Whatever term we use, Being or Non-Being, Brahman or Zero, it matters the same when we try to understand the creation, the multiplicity vis-à-vis The Absolute. How do we explain the phenomenon of creation against a Reality that transcends or negates all creation? It is as if we are faced with a situation where we are confronted with a flock of aimlessly drifting clouds that by chance form themselves into a beautiful design before getting dissipated within a short time! Or else, the clouds by chance shower rain to sustain a fertile ground – ‘by chance’, because the next season may witness a drought! Is our creation a chance happening like these clouds against an immeasurable sky that symbolizes the Absolute! Is our creation like the waves of a river that follows ebbs and tides, temporarily helping a floating boat or else casually drowning it! Formative: as some metaphysicians consider the Idea to be an arbitrary construct and unable to link it with the world of creation, the manifestation was considered to be a mechanical formation, transient and ephemeral; following a mechanical law. One could jump out of that mechanical chain of karma by being liberated into the Absolute beyond all formations. Sri Aurobindo considers such explanations as inadequate. He searches a source that carries in its bosom the CREATIVE IDEA or more precisely, the CREATIVE IDEA-FORCE that builds the worlds. How does an artist create? A Michelangelo? A Leonardo Da Vinci? He dreams of a creation, has visions that inspire, has intuitions that touch a core truth of that which is going to be creatively expressed, often has revelations that suddenly bridge up gaps in the ideas. He not only visualizes the concept but also has foreknowledge of how his creation will stand the test of time! He now constructs his ideas into a favorable shape, plans and formulates so that his ‘utopian vision’ is translated as ’realizable ideas’. Next, he develops a technology so that his ideas can be translated into a construction that has to be erected in a world of Matter – a world that is gross, concrete, and rigid in comparison to the world of ideas, which is subtle, abstract, and flexible. So, whatever was visualized through ‘Suprarational’ means – viz. intuition, inspiration, revelation has now to be meticulously worked out in the realm of Reason. If Reason does not deal with the visionary idea, nothing can be constructed in material Reality. But this is not all. The artist must have also the energy, the force; the power to EXECUTE the idea into the world of matter, blossom the idea in the material reality. He must not only have the capacity to ‘WILL’ the idea but also the capacity to ‘WILL’ for action. Let us project these same capacities to the creatrix -- the Master- Artist who builds up the worlds. The creatrix is a very high plane of consciousness. In the case of the creative activity of a human being, the creative idea springs from a mental cognitive field. However the Idea and Energy that go to create something as gigantic as the universe must also have a gigantic magnitude! It springs from a different type of cognitive field. It is a supermind whose cognitive repertoire is vastly different from the mental cognitive field. It carries a knowledge that is automatic and spontaneous, is not bound by constraints of time and space. It is a knowledge that holds the whole creation in its bosom as an ‘essence’ and is hence ’unitary’. At the same time, it is a knowledge that creates the multiplicity- the manifestation. It is a knowledge that visualizes, conceptualizes but also knows how to translate the worlds of the ‘abstract’ into the world of the ‘concrete’, the world of the ‘unity’ into the world of the ‘multiplicity’. Not only that, it is a knowledge that springs from a consciousness which simultaneously holds the WILL, the executive power, the dynamising force so that whatever is conceived is effectuated in material reality. ‘… since this consciousness is creatrix of the world; it must be not only state of knowledge, but power of knowledge, and not only a Will to light and vision, but also a Will to power and works.’ (Ibid, pg.133). The creative idea that carries the force that builds up the worlds cannot be an arbitrary idea – it must be a REAL IDEA: ‘a pregnant vibration of consciousness…an initial coming out, in creative self-knowledge, of that which lay concentrated in uncreative self-awareness’ (pg. 140). Where is this creatrix situated? If it mediates between the Absolute that is beyond forms and the world of forms, it must have an intermediate position. 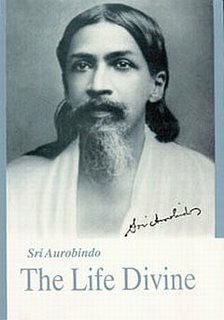 Sri Aurobindo searches for an answer that has vexed metaphysicians for ages.